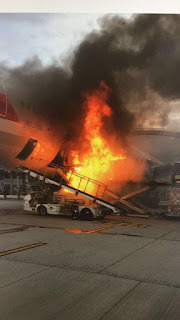 A major disaster was narrowly adverted earlier in Hong Kong when cargo being loaded onto an American Airlines 777 burst into flames. Dramatic images and videos of the incident where shared wildly on social media and yet despite how close the flames were to the aircraft, an initial inspection found damage was minimal. As a precaution and to allow engineers and airline officials to examine the aircraft more closely American cancelled the flight to Los Angeles the aircraft was scheduled to operate. Hong Kong Airport Authority said the fire, which happened at ground level, was rapidly extinguished and they were currently investigating the cause. One person, a cargo loader, was injured in the incident, although his injuries are not thought to be serious. There were no passengers on the aircraft that was being loaded and prepared for the long-haul flight at the time of the incident.